You are here: Home / Health / Dandelion Root Benefits for Health in 2018. Dandelion Root Benefits for Health in 2018. (ThyBlackMan.com) Healthy choices are not always the obvious choices. Sometimes they are altogether unexpected. I certainly wouldn’t expect a common garden weed to bring my garden or myself any benefits. But, in the case of dandelions, they are said to offer benefit after benefit for both body and world. The list of health benefits obtained from dandelions goes on and on (full list at Viral Creek). A few of the most impressive benefits stems from dandelions ability to act as a diuretic and thus aid in any condition where a diuretic is needed. Dandelions are loaded with vitamin A, B, C, and D. The weed also contains iron, potassium and zinc. Although precise studies on humans are lacking, herbalists use dandelion for cleansing the liver and gallbladder. Dandelion is very present in traditional Chinese medicine as a treatment for appendicitis, inflammation, and stomach problems. Native Americans even used boiled dandelion to counter kidney disease, reduce swelling, and to treat skin problems (University of Maryland Medical Center, Medical Reference Guide, 2013). Diabetes. Dandelions can encourage insulin production. This effect on the pancreas helps to keep blood sugar at a healthy and low level, a critical hurdle for diabetes patients. Dandelion juice, by keeping blood sugar levels low, helps to keep the system regular, which subsequently reduces the chances of risky and dramatic jumps or dips in blood sugar. Acne. Dandelions can positively affect acne caused by hormonal changes and sebaceous gland issues. Dandelion juice is said to detoxify and as previously noted act as a diuretic. These two processes help to remove acne-causing toxins from the body by way of sweating and urinating. Jaundice. Jaundice, a liver disorder, is said to respond to treatment using dandelions. As a diuretic, they help to remove excess bile in the urine. Dandelions are also said to be both an antioxidant and a disinfectant, helping to fight the infection. Cancer. Saying dandelions prevent cancer, is a big statement. But, nonetheless, dandelions have been used as a component of a healthy diet to lower risk. Dandelions’ high antioxidant and vitamin C levels help to lower the free radicals present in the body. Constipation. Dandelions are high in dietary fiber. They are said to improve the health of the intestines. The fiber helps to keep digestion regular, which in turn could prevent more extreme gastrointestinal situations in the future. When it comes to issues of the environment, we’ve come to realize that waste in almost any situation is bad. When it comes to resources, it’s usually considered more environmental to utilize the entirety of the product or plant, for as long as possible, while wasting as little as possible. Did you know you can find a benefit in every part of the dandelion plant? This ensures that each dandelion you pluck from its habitat is going to be used entirely to benefit your health, while sparing the environment. Root. 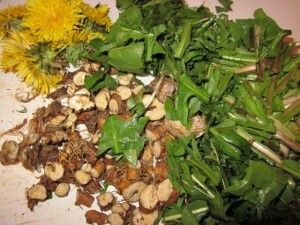 Use the dandelion root for detoxification of both the liver and gallbladder. Leaves. Dandelion leaves are delicious! They also provide the diuretic properties. They also stimulate appetite and aid in healthy digestion. Flower. Dandelion flowers are said to act as an antioxidant. Sap (found in the stem). Dandelion milk, because it is alkaline, has been used to treat some skin disorders such as ringworm and eczema. As with any medicine or alternative diet, consult your physician or nutritionist before treatment or diet changes. The serious medicinal study ( empirical scientific study ), and universal applications of herbs in the treatment of illnesses globally should be properly integrated into the overall study of medicine, and integrated culinary arts in America. Herbs should not only taste good, but also be good for you. We have lost so much knowledge about herbs which, over the centuries,helped give us our physical strength, and beautiful looks. The nourishing and medicinal use of herbs played a major role in the overall health of African Americans from chattel slavery to date. We ate certain roots, and drank certain herbal teas. There should be more articles like this specifically geared towards the overall health of the African American. It has been proven that the African is the oldest race on earth which tends to indicate that we had a diet suited to our longevity. We need to get back to that diet. The dandelion is often presented to the public as a weed to be vanquished from a healthy lawn through the usage of herbicides but seldom as a healing herb. Thank you for shining more light on this herb,and I hope you do so with others.